“A tear on the face of eternity” Rabindranath Tagore. Taj Mahal is the symbol of eternal love, a visitor may often get lost in the memories of the stories he had heard from his child-hood looking at this structure as well as its image reflected in the pool below. The story is that this beautiful structure was built by one of the most powerful emperor in the history of India for the memory of his queen who passed away in her young age. This romantic story along with the rare and beautiful spectacles visible here all combine in to his mind to form a feeling of surprise, nostalgia and a drop of tear for the beautiful queen who passed away early. The Taj is an architectural marvel formed of the fusion between Indian, Persian, Turkish and the Islamic styles. Its construction started on 1632 took 16 long years when it was finally completed in 1648! Such a long period was taken not because of any obstruction in the site, but it was such a massive structure involving a lot of precision works that deserved so much man-day involving the service of 20,000 skilled artisans; a good number of them imported from all over Asia. The ramp intended to transport materials for the dome was two mile long! Shah Jehan (Shahbuddin Mohammed Shah Jehan (5 -1 1502 to 22 -1 1666) the fifth ruler of the Mughal dynasty) wanted was sheer beauty and top class construction. ‘Makrana marble’ (the glittering white marble mined from Rajasthan) silver, gold and the jewels (mostly imported from Persia and Turkey) all were so lavishly used to decorate floral designs. 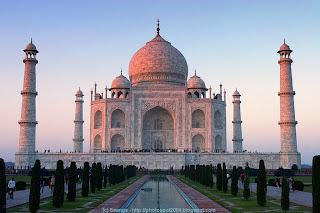 The construction to take place was no ordinary building it was intended for the memory of his dear wife Arjumand Banu Begum popularly known as Mumtaz Mahal. 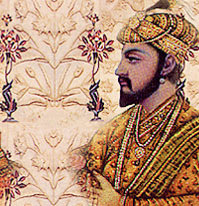 Mumtaz was Shah Jehan’s second wife and she died in child birth. The exquisite ‘jalies’ (perforated ornamental designs in wood or stone) and the calligraphy (that adorns the walls with holy verses of Qur’an) lavishly made in perfect symmetry all were all made by human hands; how many man-days would have taken for their work can only be imagined. Skilled workers from as far as Persia were brought in for the work. Who was its chief architect is still not confirmed. Gerronimo Verroneo an Italian who was engaged by the Mughals was presumed by some. Yet another opinion (more reliable) is Ustad Istakhan Effendi a Persian architect and his pupil Ustad Ahmed Lahauri were the makers the typical Persian and Islamic style adopted support this view. There are stories doing round that Shah Jehan blinded or dismembered the artisans after the work so that they will not build another structure like this else where! The Taj got listed as ‘UNESCO World Heritage Site’ in 1983 as a universally admired master piece of world heritage. The domed marble structure often considered as the Taj, but the Taj is actually an integrated complex of many structures covered on three sides by crenellated wall made of red sand-stone. (Some of the structures like mausoleums of Shah Jehan’s other wives located out side the walls are also coming under the Taj complex; of which that of Mumtaz’s favorite maid is the largest). The side facing the Yamuna River is left open. The structures coming under the Taj complex are mainly the following, The Gateway, The outside buildings and tombs, The Taj-Mosque (Masjid) and the Jawab (served the purpose of a guest-house), The Minarets (on the four corners of the plinth), the garden (in design akin to the Mughal Gardens), The Reflecting Pools, The tomb (iwan – a structure with open front and other three sides enclosed), The dome constructed on the top of the tomb, the finial and many exclusive forms of jalies with intricate floral designs, Calligraphy, bas – reliefs and valuable interior decorations. 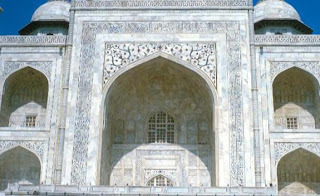 The focus of Taj Mahal is the white tomb; its elements are all Persian with symmetrical buildings with iwan (large hall with open front - generally with large arch- and other three sides enclosed). The marble dome (in the shape of onion called amrud or guava dome) that rests upon the tomb is the most spectacular view for a visitor who looks the Taj from outside. The finial is the crown exactly on the top of the dome which catches the immediate attention of the onlooker (originally it was made of pure gold later replaced by bronze). The moon with its horns facing heavenwards and the central point jointly raises the memory of a trident a Hindu symbol. The Taj-Masjid and the Jawab. The Masjid is akin in design to the Delhi Jumas Masjid and is decorated with calligraphy (calligraphy here are a script (thuluth language) designed by Amanat Khan of the palace. The Taj Masjid is floored with black marble and covered with expensive Persian carpets. The Jawab is basically designed for the sake of symmetry and it served as a visitors hall. 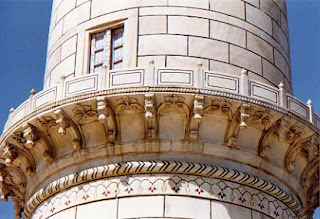 These minarets are examples of the symmetry –the watch-word- in the construction of Taj. They are constructed on the four corners of the plinth, each exactly 40 meters in height consisting of three portions, with two working balconies that ring the tower. They have been constructed in such a distance that even if by any event they fall the tomb will not be effected. 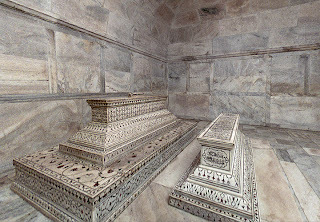 The cenotaph of Mumtaz is in the center of the inner chamber on a rectangular marble base (1.5m * 2.5 m). It is decorated with precious stones and calligraphy praising and identifying her. The cenotaph of Shah Jehan is bigger and placed in slightly elevated floor. The casket is with inscriptions praising god. Shah Jehan had a cruel fate as the completion of the building he had been put in to house arrest by his own son in a nearby building and till death he had to live as a virtual prisoner. The only favor the dear father received was that he could the view Taj from his ‘prison’ and that sight of the mausoleum of his wife would have given him some consolation in his confinement. A visitor to Taj is enriched (burdened) with a collage of emotions by the rare sights of Taj complex as well as the stories they had to tell, among them he can cherish the image of an emperor who built all these and had to see them until death as a prisoner. Informative piece. Hey, what say you if I put you on my blogroll at CommonSense with Markk? A very interesting article, thanks Sasi for sharing it. Sinu I already have a link to Kerala Articles on my site. I would be pleased if you would link to me. P.S. Well I love to exchange link with your blog...but I have three blogs so let me know from where you want a link to your blog?? 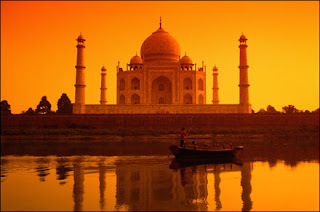 The great TAJ MAHAL looks pink in the morning, white in the noon and golden in the moon light.